Alex married Laura Belle Martin in Stewart County, TN on the 25th of April 1882. My family all calls her Laura Belle, just like her daughter. I matched her with Laura Martin via her marriage to Alexander Yarbrough and her death date, which matched family stories. There is some confusion over Laura Belle Martin's birth date though. Her headstone (in this post) and her Social Security Death Index record says Sept 12, 1861, the marriage record says she was 18 in 1882, making her born about 1864 and the census says she was 37 in 1900, making her birth year about 1863. The marriage record could have been a transcription or miscalculation error as I have not seen the original, the census is written very clearly and I am not sure of the source of the date on the headstone. So take that for what you will but she was born sometime between 1861 and 1864. 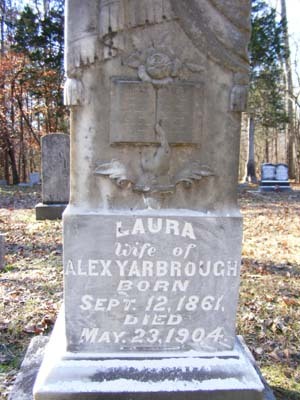 On February 12, 1901, Laura Belle Yarbrough, my great grandmother, was born to Alex and Laura Belle. When Laura Belle was three, her mother, Laura Belle Martin, died. A death record confirms that Laura Martin died 23 Nov 1904 in Lone Oak, TN. She is buried in Millie Yarbrough Cemetery in Montgomery, County Tennessee. Alex and Mary Dib Kirksey also appear on the 1920 census. This time, Alexander is 59, Mary is 35, Effie is 22 and there are four new children. Bessie, 9 , Lawrence, 6, Harry (Gene) Eugene, 3 and Roy Slayden, 2. All in all, Alexander had 12 children! Laura Belle had already married and left the house, in 1917, at the age of 16. I found, in someone's family tree, that Alexander was a farmer. 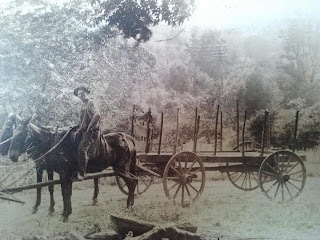 I do not have a source or any proof for this information but the photo at the top of this post (with a wagon) does seem to corroborate that he was at least a working man in a rural setting. Also in that picture, you'll notice what look like electric lines in the background. My aunt pointed that out to me. 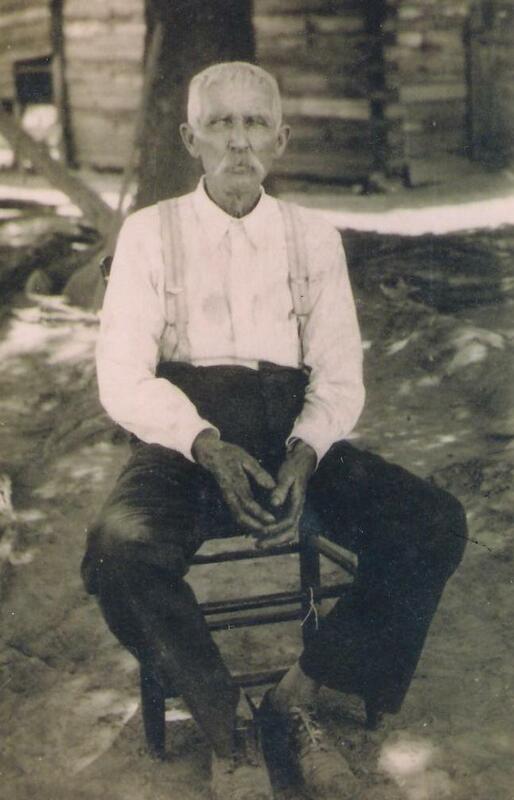 I can't tell exactly when this photo was taken but I'd guess his age to be over 40, making it at least 1902. According to my father, those are telegraph lines because of the multiple insulators and the arrangement of the lines. By 1850, telegraph lines covered most of the Eastern United States. Norwood, Carrie. 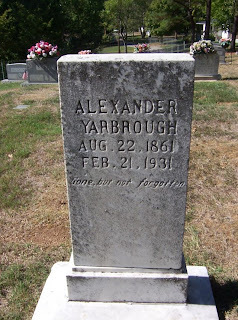 "Alexander Yarbrough." Roots and Blood. 09 May 2013. Carrie Norwood. <http://rootsandblood.blogspot.com>. "Tennessee Marriages, 1796-1950," database, Family Search (familysearch.org : accessed 16 Feb 2012), Alexander Yarbrough marriage record. Death Certificate for Alex Yarbrough. State of TN State Department of Health Division of Vital Statistics. Registration Distric 643. Certificate Number 3823. Informant : Just Yarbrough. Note : variations of the names could be Weldon instead of Wildon or Milley or Milly instead of Millie or Kilacy instead of Kirksey or something other than 'Just'. The handwriting on the death certificate is not clear. Ancestry.com, Social Security Death Index (Online publication - Provo, UT, USA: The Generations Network, Inc., 2007.Original data - Social Security Administration. Social Security Death Index, Master File. Social Security Administration.Original data: Social Security Administration. Social Security), Issue State: Tennessee; Issue Date: Before 1951. Ancestry.com, 1900 United States Federal Census (Online publication - Provo, UT, USA: The Generations Network, Inc., 2004.Original data - United States of America, Bureau of the Census. Twelfth Census of the United States, 1900. Washington, D.C.: National Archives and Records Administration, 1900. 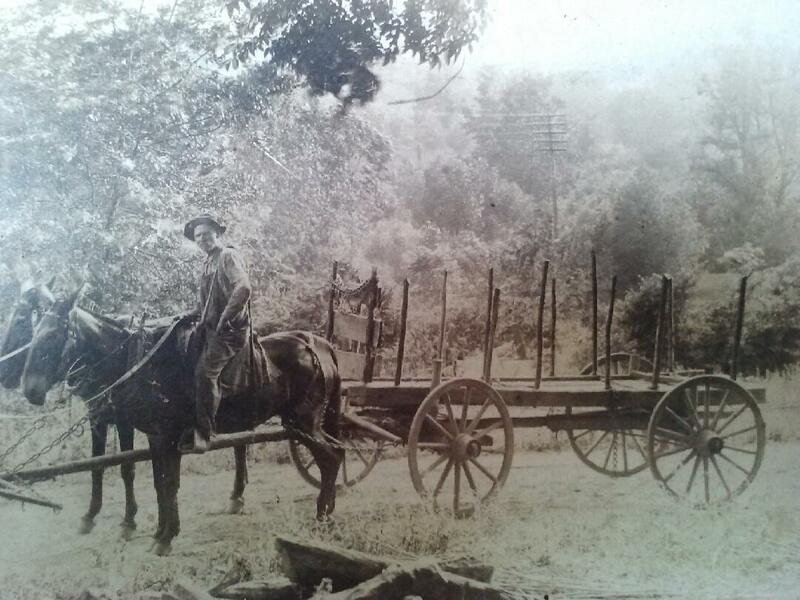 T623,), Year: 1900; Census Place: Civil District 18, Montgomery, Tennessee. Ancestry.com, 1910 United States Federal Census (Online publication - Provo, UT, USA: The Generations Network, Inc., 2006. For details on the contents of the film numbers, visit the following NARA web page: NARA.Original data - United States of America, Bureau of the Census. Thirteenth Census of the Unit), Year: 1910; Census Place: Civil District 18, Montgomery, Tennessee. Ancestry.com, 1920 United States Federal Census (Online publication - Provo, UT, USA: The Generations Network, Inc., 2005. For details on the contents of the film numbers, visit the following NARA web page: NARA. Note: Enumeration Districts 819-839 on roll 323 (Chicago City.Original data - United States), Year: 1920; Census Place: Civil District 19, Montgomery, Tennessee; Note: I did not see the actual census record, only a transcription. Effie's age could be transcribed incorrectly or it could be when the census was taken during the year v/s when she changed age. I have seen the actual census record for 1900 and Effie's age says 3 there. "Alexander Yarbrough." Find A Grave - Millions of Cemetery Records and Online Memorials. 11 Oct. 2007. 09 May 2013 <http://www.findagrave.com/cgi-bin/fg.cgi?page=gr&GSln=yarbrough&GSfn=alexander&GSbyrel=all&GSdyrel=all&GSst=45&GScntry=4&GSob=n&GRid=22104295&df=all&>. Welcome to Geneabloggers! This is a great community of bloggers! What a great Bibliography!! Saw your blog listed at Geneabloggers, congratulations. Mexican Genealogy - Blog where I help anyone with Mexican Ancestry get started with their Family History and Genealogy.